It's time to slow down a little bit and relax in a romantic and magical park of Barcelona city. If you think that you have had a little hectic days during your holiday in Barcelona, Parc del Laberint d'Horta is a perfect place to spend a day. As it is out of the city centre, Parc del Laberint d'Horta is not so crowded as other tourist attractions in Barcelona yet it is worth to visit the park because Parc del Laberint d'Horta contains nice pavillons, a maze, green area, pond, canals, fountains and French gardens. You will be suprised how the park is well preserved when you start to take a stroll inside. The entrance can look a bit old and decayed but don't let it fool you at first sight. The park itself presents the 18th century designs. It's like walking around in a wonderland as Alice's. The park is free on Wednesdays and Sundays but the entrance fee is not so much. It's around 3€. It's located on the northern part of Barcelona city. The park embodies many Greek mythology elements especially referring love. You will come across statues and castles when you enter the park. Which is more exciting that you will see two temples devoted to Artemis and Danae. Being the oldest garden in Barcelona, Parc del Laberint d'Horta is the most artistic example of horticulture. The park is also organized for people who need assistance. 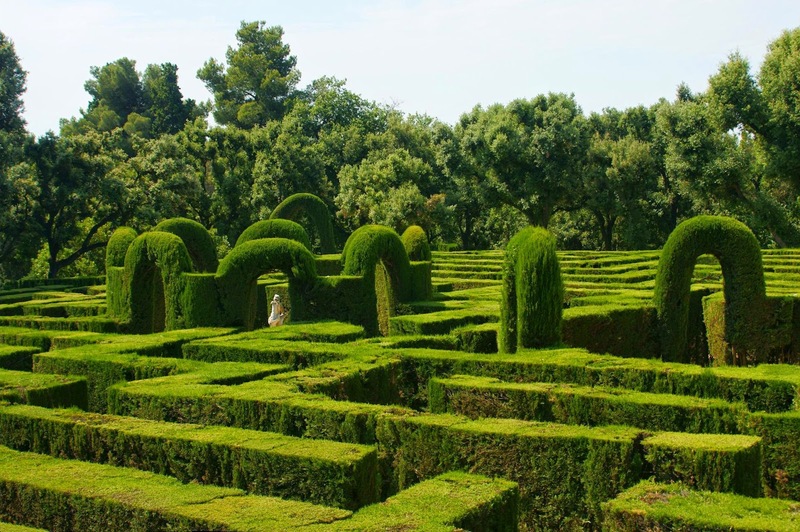 So how to get to Parc del Laberint d'Horta? You need to take metro Line3 and stop at Mundet station. It's around 25 minutes by metro. Right after you exit the station on the side of the Passeig de la Valld'Hebron, turn right then across the road. After that, take the first road on your left. It is very close to the stadium. You can't miss the park. Beside strolling in the park, you may want to have small picnic. So don't forget to prepare a picnic basket so that you can't forget the ride's taste. For cihldren and adults, you will find a lot in the park. Here below is the map of Parc del Laberint d'Horta. Enjoy the ride and relax for some time. For other places to visit in Barcelona please follow your Barcelona city guide.